It’s commonly known that dogs need to avoid foods like chocolate, alcohol, and caffeine, but what about raisins, onions, and salt? Below is a handy list of 6 surprising foods that you should never feed your dog, no matter how much they might beg! 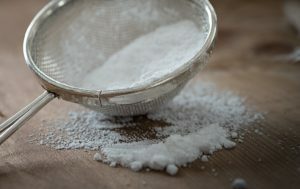 Baking powder and baking soda are both leavening agents. When either is combined with the heat of your dog’s stomach, it will release dangerous gases that can cause electrolyte abnormalities (low potassium, low calcium and/or high sodium), congestive heart failure and/or muscle spasms. 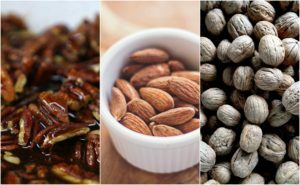 While some nuts are considered safe, there are a couple of nut varieties that you should definitely keep away from your dogs. Macadamia nuts, pecans, walnuts, and hickory nuts all contain toxins that may result in neurological symptoms like seizures (especially if they have any mold on them). And, while almonds may not necessarily be toxic to dogs, they are not easy to digest and can block the esophagus or tear the windpipe if not chewed completely. Peanuts and peanut butter, however, are safe as long as they are removed from their shells and are not salted or flavored. 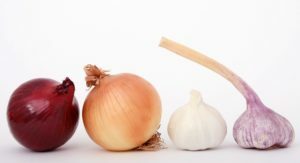 Onions, leeks, chives, and garlic are all part of the Allium family, but garlic is five times more toxic to dogs than the rest of the Allium plants. They can lead to anemia by destroying a dog’s red blood cells, no matter if they’re powdered, raw, cooked, or dehydrated. Symptoms may include weakness, pale gums, elevated heart rate, vomiting, breathlessness, and a loss of interest in food. Some safe veggies to give your dog are carrots, green beans, cucumbers, zucchinis, and cooked potatoes (but no raw potatoes). 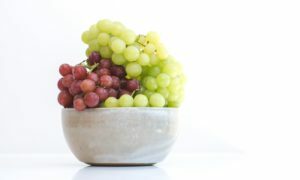 Even though the toxic substance found in grapes (and raisins by default) has yet to be fully understood and identified, it has been known to cause renal failure in dogs. When the kidneys start to shut down, it causes vomiting, lethargy, and may even lead to death. Many aspects of other fruits should be avoided as well. Seeds, fruit pits, stems, and leaves often contain substances that can irritate a dog’s digestive system and/or cause organ failure and distress. Peach and plum pits, in particular, contain cyanide, which is poisonous to both people and dogs. So which fruits are safe? Apples, bananas, pineapples, strawberries, raspberries, and watermelon are okay as long as the seeds, stems, and leaves are removed first. Along with powdered garlic and dried onions, there are a handful of spices that can cause your dog much irritation, pain, and discomfort. Salt should always be avoided due to its tendency to cause excessive thirst or urination, but too much of it can even lead to a condition called sodium ion poisoning. Too much salt can cause vomiting, diarrhea, depression, tremors, high temperature, seizures, and, in extreme cases, death. Nutmeg contains a toxin called myristicin. Small amounts cause mild stomach upset while very large amounts of nutmeg may cause symptoms including hallucinations, disorientation, increased heart rate, high blood pressure, dry mouth, abdominal pain, and possibly seizures. 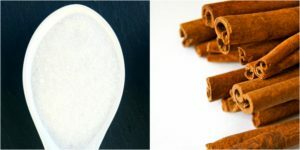 Cinnamon, both in the form of powder and essential oil, is an antigen that can can irritate the inside of dogs’ mouths. It can make them uncomfortable and sick, lower a dog’s blood sugar too much, or lead to diarrhea, vomiting, increased/decreased heart rate, and even liver disease. And, if they happen to inhale it in powder form, cinnamon can cause coughing, choking, and difficulty breathing. Like people, too much sugar for dogs can lead to weight gain and dental problems, but artificial sweeteners, like xylitol, are the real culprits here. 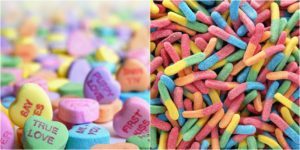 Xylitol is used as a sweetener in a variety of products, including gum, candy, peanut butter, baked goods, medications, and toothpaste. In most species, it can cause a surge of insulin which leads to hypoglycemia (lowered sugar levels). While the initial symptoms may include vomiting, lethargy, and loss of coordination, they can eventually progress to seizures and may even cause elevated liver enzymes, which can cause liver failure within a few days. Most of these foods, especially peanut butter, are sometimes made without xylitol, so check the list of ingredients in your foods before you share them with your dog. Many of these foods cause symptoms that may be delayed, so keep an eye on your pets for a few days, not just right after consumption. And, in all cases, note the amount ingested and contact your veterinarian as soon as you suspect your pet has eaten something potentially harmful. If veterinary help is unavailable, contact the Animal Poison Control line at 888-426-4435. Want to learn more? Puget Sound Puppers requires that all of our walkers download the Red Cross Pet First Aid app, a helpful source to identify what is and what isn’t healthy for your pets. And you can always visit the Animal Poison Control website* for detailed information on toxic substances for animals.